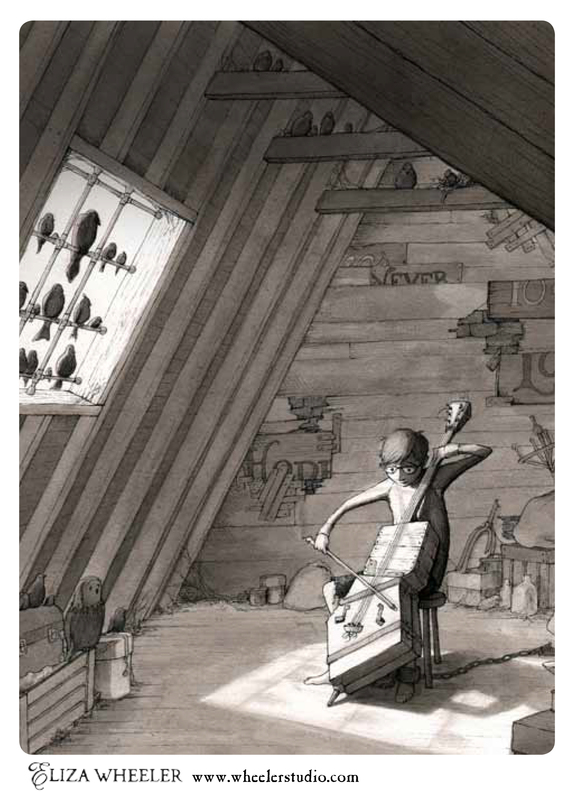 I first saw Eliza Wheeler‘s work when her portfolio was selected for honors by SCBWI. I’ve since had the pleasure of working with her on a webinar for SCBWI France. So I can say from firsthand experince that her artwork is exquisite and she’s a great presenter! Sub It Club is thrilled she’s stopped by to share her postcards and some tips. 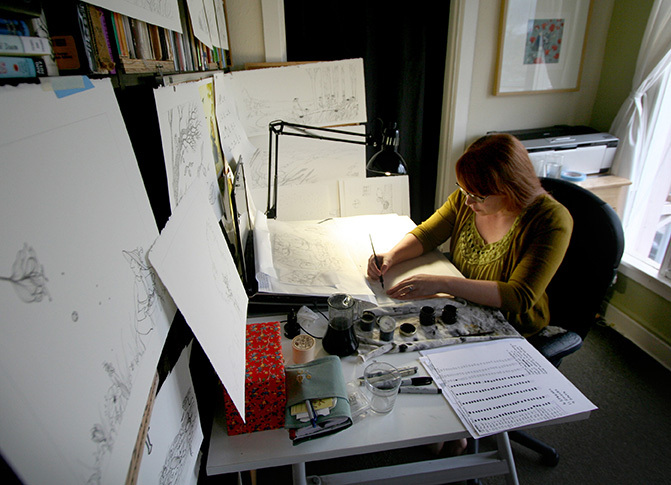 Eliza Wheeler is the author-illustrator of MISS MAPLE’S SEEDS (Penguin), which débuted on the New York Times bestseller list. 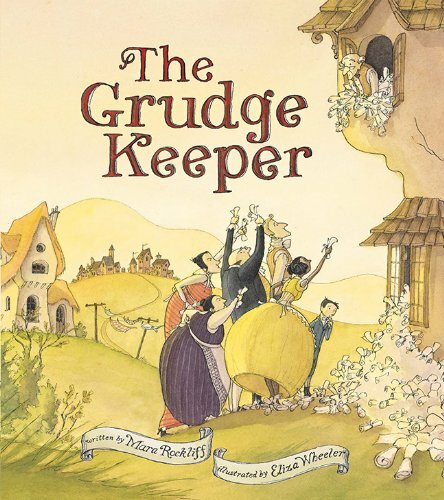 She is also the illustrator of DOLL BONES (Simon & Schuster), the Newbery Honor winning novel by Holly Black, and Mara Rockliff’s picture book THE GRUDGE KEEPER (Peachtree). 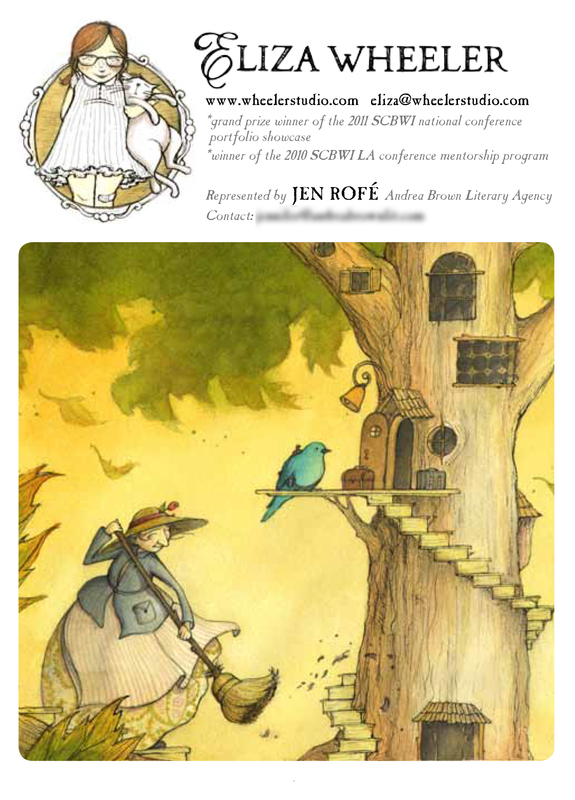 Eliza is the recipient of numerous Society of Children’s Book Writers and Illustrators awards, including the Grand Prize Award for best portfolio at the 2011 SCBWI National Conference. Eliza is a northern Wisconsin native, and currently lives with her husband in Los Angeles, California. I try to choose an image that; a. tells a story all on its own, b. has emotional pull, and c. that feels like a great overall representation of my voice. For this postcard, I decided to choose two: one to represent my darker, more mature work, and the other to represent picture-book work. This particular postcard’s purpose was to set out at an SCBWI conference, so I decided to use the whole front and back (rather than leaving room for mailing addresses). The dark side. A. story–Check! B. emotional pull–Check! and C. voice–Check! I once heard an art director complain that if they pin up a postcard, it’s a bother to take it down to look for a name/site on the back. Since then I’ve always put my name and URL on the front. Postcard front with all the contact info. Not usually. Though, if I have an idea for a stand-alone piece that I end up liking, I often choose that one for a promo. I’ve only ever done stand-alone pieces. Currently only about once a year because I have such a packed schedule for the next year. * If I was less booked I would be shooting for 3-4 times a year. *Yay! Here’s to packed schedules! *More proof of the versatility of postcards. I try to keep an on-going list, and update it using the SCBWI Market Survey that comes out yearly. My agency (Andrea Brown Lit Agency) also has done promotional mailings that specifically target about 200 publishing pros, so it’s nice to have their expertise in this area. *Great advice: keep it simple! *A Postcard Loca-vore, so to speak! Thanks so much for sharing your artwork and tips, Eliza. Find out more about Eliza Wheeler at the links below. Your style is lovely. It’s nice to know you are getting work for both sides of your artistic personality. Thanks for sharing your experience. Glad you like Eliza’s work, Joanne. Thanks for stooping by! Umm, that’s “stopping” by! No need to “stoop”! Wow, what gorgeous illustrations. I love the idea of putting your information on the front of the cards too. Thanks for sharing. Thanks for taking a look, Kaye. Yes, Eliza’s postcard with the info on the front works well! Every post in this series is terrific! Thank for bringing visitors from such skilled artists like Eliza. I just want to jump right into her watercolor worlds! Yes, me too. I love Eliza’s work. Dana, You really know how to pick great illustrators to feature. Thanks for sharing your work, Eliza. I think it’s brilliant that you did two different types of work on the postcard. And I agree with you about Eliza’s postcard– great idea.